We spend a better part of our day sitting at our desks which can be very taxing on our back, neck, arms, and eyes. Poor working conditions can cause momentary pain and in some cases long term injury as well. Adverse working conditions are also a major contributor toward reduced efficiency and loss of income for businesses. Increased productivity: By eliminating the ergonomic risk factors it is possible to increase productivity. Making sure that the job allows for less exertion, fewer motions, good posture, and better reaches and heights the work stations can become more efficient. Reduced costs: Providing ergonomic solutions also help to prevent costly MSDs. Implementing a workplace wellness initiative can result in significant cost savings by reducing both direct and indirect costs. Improved employee engagement: When companies place great importance on the safety and health of their employees it reflects in the performance of the employee. If employees do not experience discomfort and fatigue during their workday, it is bound to increase their involvement in various work projects and improve their morale. Moreover, it can decrease absenteeism and reduce turnover as well. Improved quality: When the employees are not fatigued or frustrated they are able to give their 100% to their jobs. If a job is extremely taxing on a worker, he may not be able to perform to the best of his capabilities. Helps create a better safety culture: Better ergonomics promote your company’s commitment to providing a safe and healthy environment for your workers. Healthy employees are your greatest asset, and by creating a healthy environment, you will be able to optimize your company’s performance. Most people discount office ergonomics because they confuse the symptoms with other causes. We tend to attribute tingling in our hands and feet to anxiety, eye strain to working too many hours, and muscular pain to accidental injury. Although, this may be right in some cases they can sometimes also be caused by inconsequential factors like an uncomfortable chair, repetition of detrimental movements and poor lighting. One of the most significant problems that poor ergonomics can cause is musculoskeletal disorders (MSDs). These are painful, debilitating conditions that affect tendons, muscles, joints, ligaments, nerves, cartilage, spinal disks, and tendon sheaths. 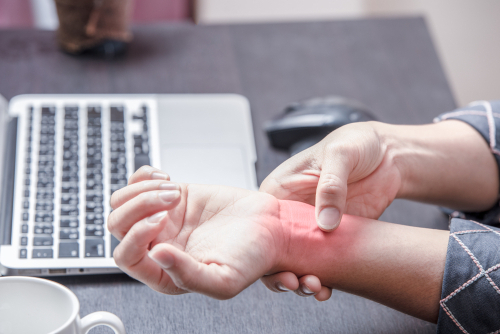 The most common MSD is carpal tunnel syndrome (CTS) which refers to a condition where you experience a cramp in the wrist. This could cause symptoms such as tingling, sharp pain, and numbness. In some serious cases, it could affect mobility and even result in partial paralysis. Ergonomic injuries do not happen overnight. They result from gradual exposure to low-level harmful agents over longer periods of time. These risk factors are not usually harmful, but prolonged exposure could exceed the body’s ability to heal thus resulting in reduced bodily functions. Repetitive tasks: Many work tasks are repetitive in nature which when combined with other risk factors can result in MSDs. Awkward Posture: Joints work most efficiently when they are closest to the mid-range motion. 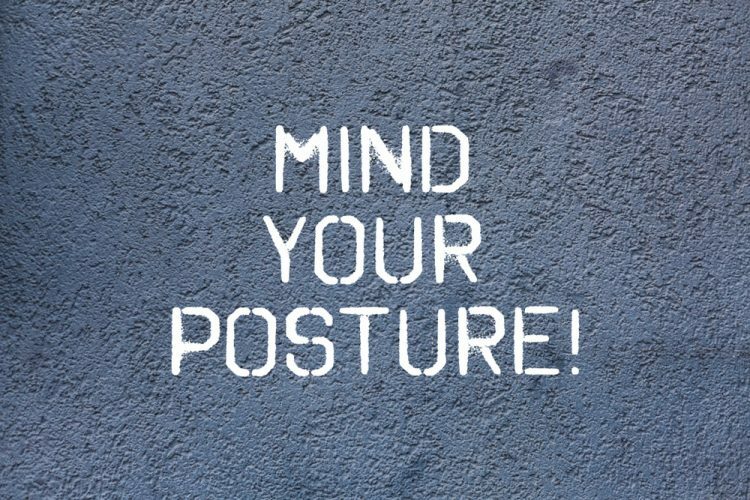 Awkward postures place great stress on joints which increases the risk of MSD. Forceful exertions: Many tasks require high force which increases the pressure on muscles. This increased fatigue could also lead to MSD. Workers that perform repetitive tasks fall victim to tissue damage and fatigue. Allow them 60 to 90 seconds breaks after every 20 to 30 minutes of work. This will give the muscles time to recover. Tasks that require awkward postures create a strain on the extremities of the body which over time could develop into debilitating injuries. You can find comprehensive solutions to eliminate the root cause of awkward postures. Some objects require extra force to lift, hold, or pull. Use of mechanical devices which assist in such tasks could reduce the risk of injury. Prolonged use of vibratory tools could cause injury to the fingers. Using tool wraps and gloves could help control vibration. Protect the natural curve in your spine. Practice good posture as it will help prevent injury to spinal disks. An ergonomic arrangement of the work station allows the employees to work in a relaxed and neutral position while practicing perfect posture. This minimizes the risk of injury. What is the ideal desk height? Proper desk ergonomics include making sure that there is ample space under the desk for your knees, thighs, and feet when you are sitting. Your hands should roughly be parallel to the floor when you are typing at your desk. 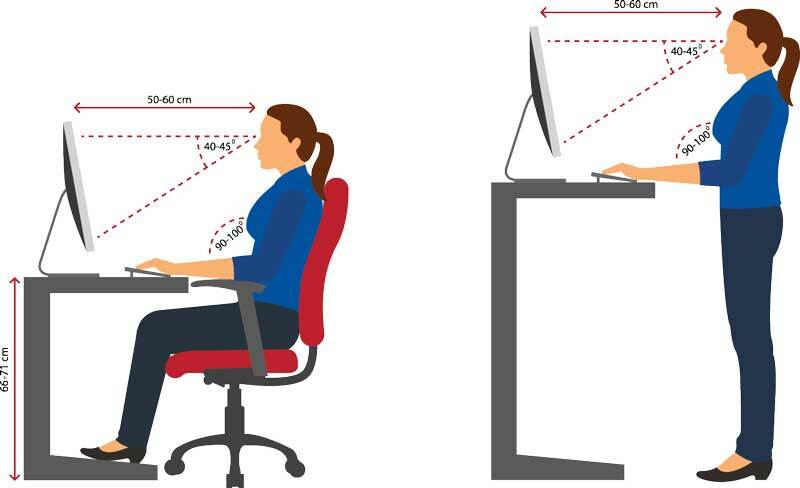 If your desk does not support this posture, you can put your desk on risers, get a footrest, invest in a keyboard tray or simply adjust your chair’s height to get that neutral position. Another option available is to get a desk with height-adjustable legs instead of a fixed height desk. This is also feasible because not all humans are made the same and therefore there is no one size that fits all. This also eliminates the need for a footrest or an adjustable keyboard tray. For standing workstations, the fixed-height desk should be adjusted to facilitate the employee standing. A stool should be provided with this type of workstation so that eth employee can rest in between. Which is better – sitting or standing? Some adjustable-height desks allow you to alternate between standing and sitting mode. This is highly beneficial for your health because scientists associate many diseases with sitting all day. These include everything from obesity to increased blood pressure to spine damage. Standing all day is also not recommended by doctors a swell as because it could cause some serious health concerns as well. Therefore, alternating between the two is the best option as it provides a perfect balance between dynamic and static activity. Lumbar support: The chair should be designed in a way to provide support to your lower spine. It should follow your natural spine curve thus protecting your spine from injury. If your chair does not provide lumbar support place a small pillow or a rolled-up towel to relieve the strain on your lower back. Chair height: Your chair height should be adjustable so that your hands are at the height of the desk your feet should be parallel to the floor or on a footrest. Seat depth: Your chair should have a soft, deep cushion to allow you to sit comfortably. Moreover, an ideal chair should have a distance of three or four fingers between the seat and the back of your knees. Slightly inclined backrest: Studies show that the ideal seated posture is not the upright 90-degree posture but a reclined posture of 100-110 degrees. This helps decrease the intervertebral disk pressure in the lumbar spine. Sitting erect is not sustainable, relaxed sitting while reclined sitting is. Chair armrests: Ideally, armrests should be broader, adjustable and padded to provide the maximum comfort. They should be at the proper height that keeps your arms parallel to the floor without causing hunched shoulders. Moreover, it should be easy to get the armrests out of the way whenever you need free access to the keyboard and mouse. Breathable material: Some people prefer mesh chairs as they are more comfortable. Chairs constructed with breathable fabric are also a great choice. Make sure that you choose a comfortable chair as you have to spend hours sitting in it. Chair mobility: A chair that has wheels and the ability to swivel is better than a stationary chair. It allows you to reach the different things on your desk easily, without putting additional strain on your body. Despite beliefs of a popular trend, ball chairs or exercise balls are not an example of good ergonomic office chairs. They might be used for temporary sitting to help strengthen your core; however; they do not provide any back support. Also, these balls are constructed with non-breathable materials. Moreover, these ball chairs are not stable and require careful inflation to avoid slips and falls. Keyboard and mouse are output devices which make interactions with the computer easy. The keyboard helps to type numbers and letters while the mouse helps to draw and execute program functions. Overuse of both these devices could result in MSDs. Besides typing, the keyboard is used to perform various functions using the control keys, cursor keys, or keyboard macros. However, all these functions can also be performed with the mouse? Nowadays many people use the mouse to operate the computer instead of the keyboard. For a perfect posture, it is vital to align the center of the body with the section of the keyboard that you use the most. This could either be the numeric keypad or the alphabetic area. Most people use a regular keyboard design placed in the proper neutral position. Simple actions like using the keyboard tray with a slight downward tilt or retracting the feet at the base of the keyboard can help improve hand posture. Moreover, keyboards are available in both right-handed and left-handed configurations; therefore make sure that your office has both the options. Place the keyboard and mouse closer to the edge of the desk so that you do not need to stretch unnecessarily. If you type a lot your hands will get tired even with the best designs. So make sure that you take short breaks to allow your muscles to recover. It is vital to place the monitor at the correct distance and height. But how can you find the correct distance? It is simple – sit back and extend your arm. The distance at which your middle finger touches the screen is the ideal distance. This method helps prevent craning of the neck. For the perfect height sit in front of the monitor and close your eyes. The address bar should be at your eye level when you open your eyes. If you do not see the address bar, then raise the monitor for the perfect height. Moreover, do not tilt the monitor over 10 to 20 degrees as it may make it difficult to read the text. A monitor should be placed perpendicular to the window to prevent eye-straining glare. Does your job require that you talk a lot on the phone? In that case do not cradle the phone between your head and neck as it could cause strain. Use a headset to prevent this problem. There are various ergonomic accessories that help individuals improve their workspace. For example, people who are shorter in height may benefit from a footrest if the workstations are not adjustable. Similarly, headrests allow you to rest your head when you take a break thus relieving the strain on the neck. Another accessory that practices ease of work is the document stand. You can use a freestanding document holder and place it next to the screen and at a slight angle. This makes it easier to type the documents without straining your neck. Having the proper ergonomic office furniture is only part of the solution to your discomfort and injury prevention. You need to make an effort to practice ergonomics! Taking these measures, you can get more work done in a day with less effort. Whether you are sitting while you work or standing at the receptionist counter, the best thing that you can do to stay more healthy and active during the day is to take care of your posture. Make sure that you do not strain your neck or your wrists while you are working. Take frequent breaks so that you can move around and stretch. Try getting in a few breathing and tightening exercises while you are at your workstation to strengthen your core. This will also help prevent back pain and get your spine in beautiful, natural shape. Working on computers for the whole day can cause eye fatigue. You should look away from the screen after every 10 to 20 minutes to reduce this stress. Change your focus as it gives the eye muscles a chance to relax. Following the proven ergonomic improvement process and proper work practices, you can improve the overall productivity and comfort at work. The quality of light can affect your well-being and mood. Dim or harsh lighting could cause stress, fatigue, and eye strain. Natural light is the best light for your office as it improves mood and morale, aids concentration, and decreases anxiety. Moreover, it is essential to position your light source in a way that provides uniform light. Don’t sit with your back to the window or facing it as it will make reading the computer screen very difficult. It might be trickier to settle on a thermostat that everyone finds agreeable due to individual preference. Still, an effort should be made to find a temperature that most people agree upon. Moreover, colder temperatures should be avoided to prevent MSDs. Research proves that indoor plants can help reduce fatigue during attention-demanding work. So get help from nature and enjoy a productivity boost in your workplace. Your workplace should be all about you. It’s where you spend a better part of your day. It should support your well-being as well as how you work best. Therefore it is essential that you practice proper posture, use ergonomic accessories, and take frequent breaks. In addition, the above tips will help you optimize your desk setup thus ensuring your best productive days and also having ample leftover energy to enjoy life after work too.